Name Change Affidavit duly Notarized. Advertisement Publication In Two Newspapers. Publication in Gazette of India. Get all the Documents Required for Name Change at your Doorstep executed on e-Stamp Paper & the Required Newspaper Publications. Sign all the Documents and make the Demand Draft in the favor of Department of Publication. Post all the Documents to Department of Publication (Gazette of India) for the publication of Notification of Name Change and Get your Name Changed. 1.Name Change Affidavit duly Notarized. 2. Newspaper Publication in 2 leading Newspaper. 3. Hard Copy and Soft Copy (C.D) of Printing Matter. 4. Certificate on prescribed proforma. 5. Forwarding Letter to Department of Publication. 6. Detailing Letter about the process. *Below mentioned Fee is payable in 2 Installments. 1. 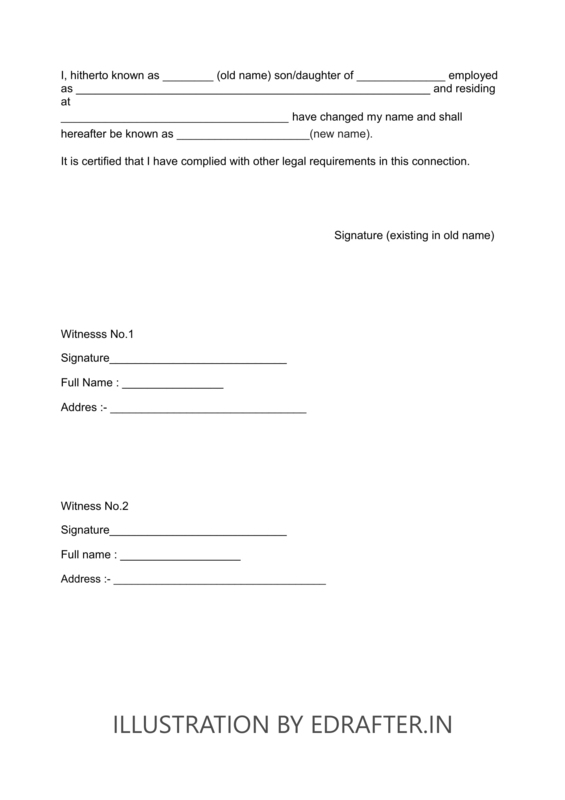 Prepared draft of Affidavit(without Stamp paper & Notary). 2. Hard Copy and Soft Copy (C.D) of Printing Matter. 3. Certificate on prescribed proforma. 4. Forwarding Letter to Department of Publication. 5. Detailing Letter about the process. *We provide Newspaper Publication as well in Documentation Package but at extra cost. To avail, Kindly place request. WHAT IS NAME CHANGE PACKAGE? Name Change Package is a service started by eDrafter.in to provide the ease in Name Change process. 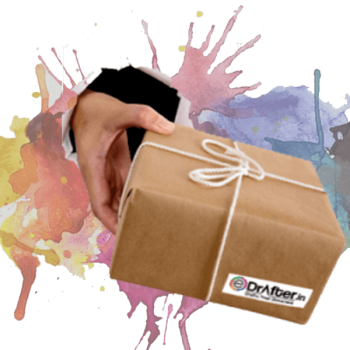 While availing our package service we will prepare and provide you the whole set of Documents in which what you just need to do is sign the Documents, Make the Demand Draft and Post the Kit to the Department of Publication. While availing our Package there will be no need to rush and face the queues and press of people. JUST THINK YOUR BRAND NEW NAME AND WE’ll HELP TO CONVERT IT INTO REALITY. How the Package Service Work? Choose your Choice of Package and Provide the Details by Filling up the given Form. Then we will draft your Documents and will send it to you first at your e-mail address for your review and approval. Once you approve we will execute the Documents on e-Stamp paper(whichever required) and will dispatch the Name Change Kit to you and further you just need to sign it and draft a demand draft for Notification Publication and send all the Documents to Publication Department (at the address provided in a Kit). What is the difference between Full Service Package and Documentation Package? In Full Service Package, we provide Full assistance for getting Name Changed i.e. from Publishing Advertisement in Newspaper to Preparing all Documents required for Gazette Notification. Full Service Package Service is available for Delhi/NCR/Haryana/Karnataka/Maharashtra only. In Documentation Package, we provide all other Documents required for Publishing the Notification in Central Gazette except Stamp paper & Notary service in Affidavit. Documentation Package is available for all States. Who can avail the Name Change Package service? Any Citizen and Government Employees can avail our Package. What type of Documents will be provided in a Package? 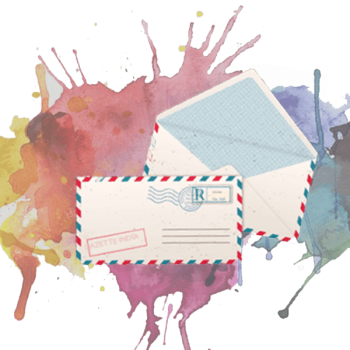 Detailed Letter about sending the Documents in Publication Department along with mailing address. IS IT MANDATORY TO PUBLISH NOTIFICATION IN GAZETTE OF INDIA? It depend upon the requirement of Change of Name. It is better and always recommended to get it publish in Gazette as the name change Notification will be published by the Government which is a strong and more powerful proof of Name Change. Many Government Bodies like Public Banks, UPSC and other authorities demand Gazette Notification. Also, for Govt. Employees it is mandatory to publish the Notification in Gazette of India. In which States Gazette Department is present? Where to publish Notification - In Central Gazette OR in State Gazette? It is always recommended to publish the Notification in Central Gazette as the Notification published by the Central Government holds more power and better recognition as compare to the Notification of State Gazette. Where to publish if my state is not holding Gazette Department? If the Gazette Department is not available with the applicant’s state then he/she can publish the Notification in Central Gazette – Delhi. How to download Name Change Notification from egazette website? STEP 2 – After that, Select the Search Gazette. STEP 3 – After that Click on Search Extra Ordinary/Weekly Gazette. STEP 4 – After that Select the Category as Weekly Gazette. STEP 5 – Select the part as Part IV in Part. STEP 6 – After that, In Ist Calendar (Dates of Saturday) to IInd Calendar (Dates of Saturday). Select the assumed dates in which your notification suppose to be published. STEP 6 – After that, Click on the Standard Report button which will provide the link to download your Gazette Notification and download the requisite pdf file. STEP 7 – Use Control Key + F Key to find your Name (Old/New). 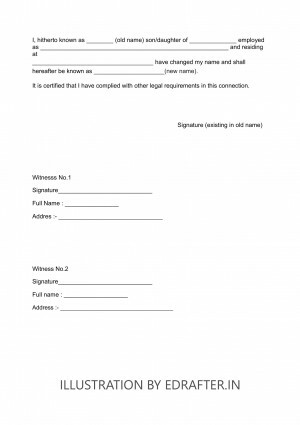 STEP 8 – Download the whole Gazette to make your Own Copy. The Copy Downloaded further needs No Certification from the Department. What is the prescribed fees for notification of name change in gazette? The Fee have to submitted by Demand Draft/Indian Postal Order drawn in the favor of Controller of Publication, Department of Publication, Civil Lines, Delhi-54 OR “Controller of Publications, Delhi” . Is the Central Gazette Fees for notification of change of name included in Name Change Package? No, Central Gazette Fees for Publication is not included in our Package. You need to pay separately & directly to Central Gazette while preparing a Demand draft though we will guide you about the details of DD. Hi My son is 15 months old, the only document I have right now is birth certificate. The name in birth certificate need to be changed. but local municipal body says that name on birth certificate cannot be changed. Can I change his name by following affidavit, add in newspaper and gazette notification? 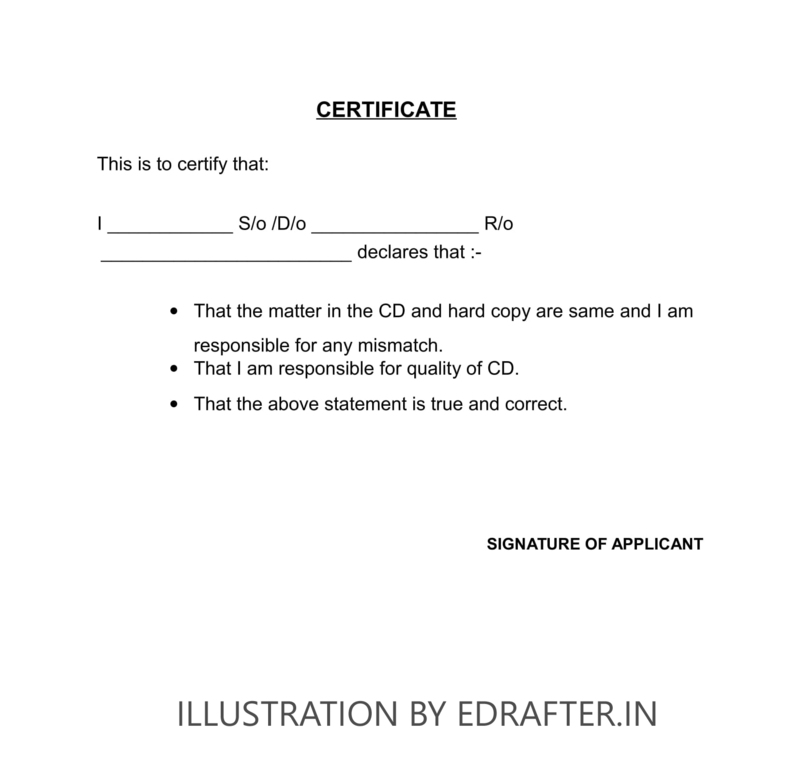 Name in Birth Certificate can be changed by providing the Gazette Notification as Notification in Gazette of India is a biggest proof of name change, so you can go ahead with publication in Gazette of your State. Kindly advise whether Central PSU employees also require similar documentation as applicable for Govt. Employees ? Hlo, myself Baby kumari .I am a B.Sc 1st year student of College of Horticulture Rajendranagar Hydrabad Telangana but i am a resident of Bihar. I desperately want to change my name to Pooja chaudhary because as u can see i don't like my name at all.So i want a suggestion so plz help me. Dear Ma'am, You can surely apply to change your Name in Central Gazette and we will assist you by providing the Documentation Package. Kindly place the request for the Package and we will get back to you. Thank you! hello I have changed my name from ROHIT KUMAR to ROHIT MEHRA in september 2015 through affidavit and news paper publication but not in gazette notification. Now i have ID proofs in my new name but educational certificates and some other documents in old name . Can i obtain a gazette notification with old news papers . is it possible obtain gazette notification mentioning my actual date of changing name which is in september 2015. 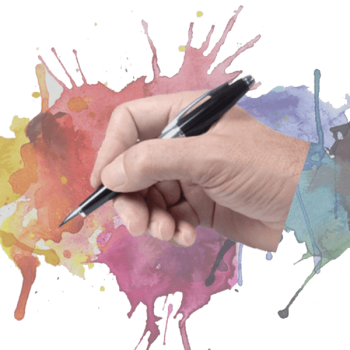 The Affidavit and Newspaper Publication in order to submit in Central Gazette should not be older then 1 year, so in your case you have to carry out the process again that is preparing new Affidavit and again publishing the same in Newspaper. Thank you! Sir, I need your advice regarding a issue I am currently facing. Sir I got my name changed from gazette of India but as I have completed my final year MBBS but college is not accepting my new name and not ready to issue a degree in the new name. Is there any law regarding change in name in old academic certificates? If yes, what should de done? i am a student and want to add surname before applying for a passport.do i have to complete 3rd step i.e regarding gazette ? Yes, Notifying it in a Central Gazette is always recommended but if you are just seeking to Change Name in Passport than Affidavit and Newspaper Publication will serve your purpose. Thank you. Thank you for writing to us but in Old Academics Certificates Changing Name is quite tough task and it depends upon the Board/Authorities that whether they will accept application Or not. For say, In CBSE the time duration to update Name in Certificates is One Year from Passing Date. So, we recommend you to check from the authorities about their rules and regulations. Thank you! If i have changed my name by "Gazette Notification" . Is it legal out side of India? I mean my degree certificates are with old names and my Passport is with new name. do i really have to change my name in all degree certificate? or if i attach Gazette Notification with degree certificates - with old names it will be enough while applying for Permanent resident Visa of any country or finding and doing Job in Software company? Also if i remove Middle name and keep only first and last name is it OK? any where is it mandatory to put middle name anywhere in India or Abroad?